For some years now world-class athletes and thoroughbred race horses have benefited from laser therapy treatment. The good news is that this technology is now available for our own pets. 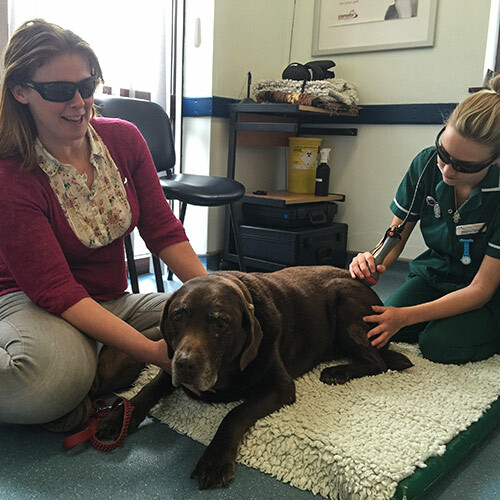 A relatively new treatment in veterinary medicine, Laser Therapy delivers an infra-red beam of deep penetrating light energy into a targeted area of the animal’s body. The light interacts with damaged cells, accelerates healing and dramatically reduces inflammation and pain. 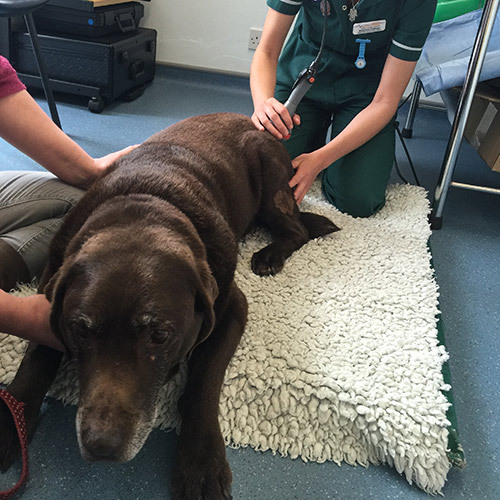 Bridgwater based Quantock Veterinary Hospital now regularly uses a top of the range Companion Therapy Laser machine which is being put to good use on local pets. Kris Herman, Veterinary Surgeon at Quantock Veterinary Hospital in Bridgwater explains “As our pets age, recover from trauma or surgery, or simply need relief from everyday aches and pains, this advanced and gentle technology offers a drug-free, surgery-free, non-invasive and painless treatment. Primarily used to reduce swelling, reduce pain, and speed the healing process, we’ve seen some impressive results and now offer it to complement other more traditional therapies or on its own depending upon the case. “The non-invasive laser light beam deeply penetrates tissue and induces a biological response called ‘photobiomodulation’. It is this response that leads to reduced pain, reduced inflammation and increased healing. Two laser treatments are often all that is required for post-surgical patients to reduce swelling and to speed healing. For patients suffering from chronic conditions such as arthritis or spinal pain, after an intensive induction phase, long term therapy programs involving a laser treatment every two or three weeks can make a real difference in keeping them mobile and comfortable. Other conditions such as tendon and ligament injuries, skin wounds, abrasions, bite injuries, dermatitis and burns all respond well to laser therapy. Because laser therapy laser can be administered without touching the painful area, vets are able to provide immediate pain relief to very sensitive tissue. Laser therapy reduces inflammation by increasing vasodilation, activating the lymphatic drainage system, and reducing pro-inflammatory mediators. As a result, inflammation, bruising and oedema are all reduced when treated with laser. This is especially important for conditions where the use of pain-killers and anti-inflammatory medications is wanted to be minimised because of factors such as the patient’s age, and kidney or liver health concerns.